Teen Programming | Simon Family JCC | Fitness. Family. Fun. For Everyone! The Teen Department promotes a community where teens forge social and Jewish connections. Multiple programs designed to create opportunities for social action, creative arts, socialization and athletics give teens a place to find their strength and form positive relationships. One goal of the department is to serve as a link to existing organizations, including BBYO, USY, NFTY, different schools and communities. Come connect with your Jewish teen community! New programs are always being created to best serve this dynamic and growing group. Open to all Jewish children, ages 12-16 for Games and ages 12-17 for ArtsFest, the annual JCC Maccabi sports and performance festival features delegations of Jewish teens from all over the world. The Games are an Olympic-style sports competition for baseball, basketball, dance, flag football, golf, ice hockey, lacrosse, soccer, softball, Star Reporter, swimming, table tennis, tennis, ultimate Frisbee, volleyball, and track & field. The ArtsFest is a performance workshop and showcase for acting/improve, culinary arts, dance (audition process required), musical theater, rock band, visual arts, social media squad, and vocal performance. Travel, food, lodging, and Team Virginia Beach delegation gear and uniforms are all included. This year’s destination for the Games and the ArtsFest is Detroit, Michigan. Individual performers and athletes are all welcome. If TeamVB has full sports teams, then organized practices will be held. The deadline for the deposit of $150 is March 25. Contact delegation head Tom Edwards for schedules, deadlines, and information at tedwards@simonfamilyjcc.org or 757-321-2308. Sundays, 1-3pm, B’nai B’rith Youth Organization (BBYO)is the largest Jewish teen organization in the Tidewater area. 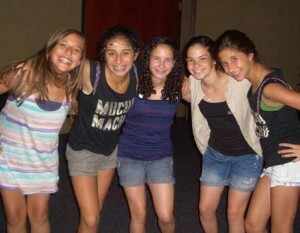 Teens meet weekly at the JCC to program within the folds of BBYO. Activities involve community service, socials, athletics, social action and Judaic. BBYO also has several conventions a year as well as summer leadership programs and trips to Israel. Being a part of this organization not only allows your teen to be with other Jewish teens, but guides your teen into leadership positions for the future. BBYO is open to all Jewish 9-12 graders. Join other high school students in our counselors in training (C.I.T) volunteer program. The goal of the program is to teach teens about working with children in a positive and nurturing environment while also providing them leadership skills and hands-on experience. Students are required to commit to one day a week from 3:30-4:30 and Sunday meetings once a month. CITs can earn community service hours for National Honor Society as well as other high school programs. Also, if a CIT completes the year-round program they may come and be CITs during camp on a weekly basis without needing to commit to two consecutive weeks.